If you are lucky enough to be in Catalonia during the summer then try and find a fiesta where there is a display by the Castellers de Vilafranca. To discover why Catalans have such a terrifying fascination with building human pyramids, or towers, one has to go back to the 17th century when a Valencian dance, the Ball de Valencians, involving quite a small number of people balancing on each other’s shoulders was popular. It is this dance that has gradually evolved into the current tradition. It was around Tarragona and Penedès that the castles became most prevalent – we know, for instance, that as far back as 1805 there were two rival groups making towers in Valls, the capital of the Alt Camp area in the Camp de Tarragona. These two groups – the farmers and the craftsmen – formed the basis of today’s Colla Vella dels Xiquets de Valls and Colla Joves Xiquets de Valls. The Castellers form themselves into a solid base foundation of compact bodies – joining arms and hands together in an especially intricate manner that will help support all those who are to climb above them – which, after all, could be several tones of weight. On this foundation, layers and layers of people are constructed – each standing on the shoulders of the people beneath them. The very pinnacle of the tower is made up of children of about 10 or 12 years old and the whole structure is complete when a youngster waves to the crowd standing at the top. It is not uncommon for the castles to be 9 ‘storeys’ high and last year the Minyons de Terrassa completed one that was 10 people tall. Although there have been the inevitable times when the tradition has faded somewhat during the last twenty or so years it has developed into a major contemporary phenomenon with many groups all over Catalonia and, indeed, other parts of Spain such as the Balearic Islands. Most Catalan towns now have their own team or Colla, comprising of men, women and children who compete against each other to try to construct the highest tower. Dismantling the towers can be as dangerous as actually constructing them in the first place and ‘collapses’ are not uncommon. Another of the benefits of the solid foundation, though, is that the bodies there help soften the fall somewhat. The most famous of all the groups of Castellers originate from Vilafranca del Penedès and they can often be seen, in their distinctive green shirts, performing throughout Catalonia during the summer. Their own major festival the Festa Major, dedicated to the town’s patron Saint Felix, is held at the end of August each year. Established only in 1948 the Castellers of Vilafranca have more than 400 active tower-building members and they regularly construct terrifying, trembling human towers accompanied by the traditional Catalan music of the Grallers- the gralla is a high-pitched wind instrument – and a cacophony of noise from the hundreds of people surrounding them. At the Festival of Saint Felix they, along with other groups of castellers, have a week long celebration of building the various kinds of castle it is possible to devise. 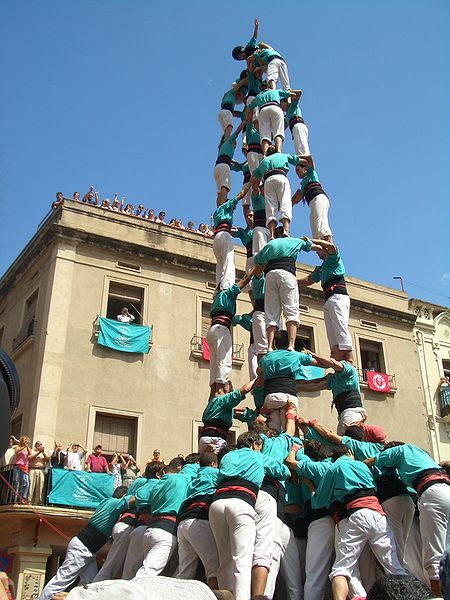 Under the direction of their Cap de Colla, as the team leader is known, the Castellers of Vilafranca might even try to replicate their ‘torre de nou amb folre’ of 2005 – which still remains the most difficult and dangerous tower ever constructed. Catalan festivals are amongst the very wildest in Spain. One can anticipate concerts, theatrical performances, recitals, fairs, ear-splitting firework displays, giant figures, typical Catalan dances – sardanas – and parties that last all night to blend in with the next day’s activities. At the heart of them all, however, are the compelling spectacles of Castellers enjoying their death-defying pastime. This truly is a remarkable experience.